The data center market has come a long way. Just from rows of servers and computing resources processing islands of information, it has become the center of all things IT. The evolution of the data center from its rudimentary origins to what it is today defines the massive infusion of technologies that has changed the very personality of the IT infrastructure market. Thanks to virtualization and cloud which have ushered in this revolution. As Srinivasan CR, Senior Vice President, Global Product Management & Data Centre Services, Tata Communications puts it, “With the rise of digital transformation, enterprises are looking for an IT infrastructure that can deliver flexibility and agility alongside fail-safe security. The cloud is the new IT architecture for enterprises and will continue to be a game changer for the information and technology industry. Enterprises will invest more in cloud services, boosting demand for network services and data centers. With cloud services, enterprises don’t need to make huge investments in infrastructure to use a huge infrastructure. Let’s try and decode what has driven this change and why IT infrastructure companies of all hues focus their time, energy and investments on creating state-of-the-art data centers. “India is currently the fastest-growing start-up ecosystem in the world and will also be the largest developer market by 2020 with over five million developers. This region is poised to unleash a tremendous amount of innovation in the next decade and the next generation businesses are going to be built on the cloud,” says Prabhakar Jayakumar, Country Manager, DigitalOcean. With this backdrop, analysts say that ‘On Prem’ IT as we know today is on the threshold of a major transformation. As IT organizations across the world embrace ‘IT-asa-Service,’ it is creating huge demands for the ‘Off Prem’ infrastructure delivered via data centers and manifested as cloud. 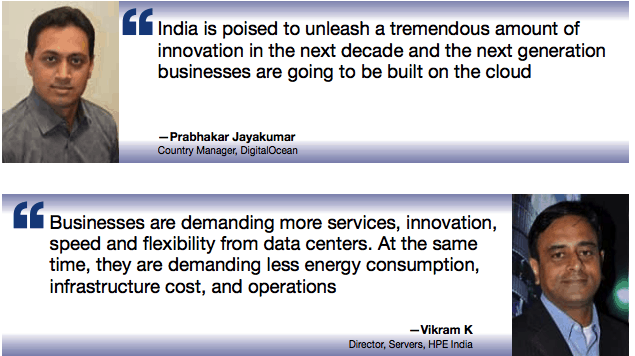 No wonder the Indian data center market is poised for growth. According to Gartner, the Indian data center infrastructure market will reach $2 bn by the end of 2016. This represents a 5.2% increase from 2015. Gartner analysts say that this foretells the growing demand for cloud services hosted locally in India. The major industry sectors such as Government, BFSI, Manufacturing, Retail/eCommerce, Healthcare etc have shown increased willingness to adopt public cloud hosted from local data centers. Given the huge potential, companies like Amazon Web Services (AWS) are upping their ante. Recently the company launched regional data centers to service the clients more efficiently. Amazon announced Mumbai as a region – its 6th in APAC and with localized data centers the company is looking at deepening its mandates from India. Similarly Microsoft and IBM have also launched localized data centers to penetrate into the multi-billion Indian IT infrastructure market. Quips Srikanth Karnakota -Director – Server and Cloud Business, Microsoft India, “Although cloud, mobility, IoT and virtualization remain the catch words, data centers are the backbone to bring these solutions to life. Data centers will play a major role in integrating several requirements at the infrastructure, ecosystem and end-user level.” “In addition, automation and orchestration are becoming high priorities for Indian CIOs as well. Software defined infrastructures, and an increased focus on disaster recovery and business continuity, will also lead to an increased spend on data center infrastructure,” adds Karnakota. Industry experts say that the confluence of three trends viz., a massive explosion of data, intelligence from machine learning, advanced analytics, the economics and agility of cloud computing, is and will drive transformation across entire system of production, management and governance. Transformation will also require rich systems of intelligence. Cloud continues to define the Indian market dynamics as far as adoption of data centers is concerned. With an estimated CAGR of 32% over the years 2013-2018, the growing cloud market in India is also determining the upward demand for data centers. Gartner’s Cloud Adoption Survey in October 2015 revealed that 61% of respondents in India indicated that they are currently using cloud services, and an additional 31% plan to use cloud services by the end of 2015. Current trends suggest that even 3rd party data centers will witness a year-over-year (YOY) growth at 25% CAGR. The Indian data center industry is passing through an interesting phase. The biggest trends in data centers are the demand to virtualize infrastructure and the rush towards the cloud. We are also witnessing a software-defined everything (SDx) scenario where virtualization is not just happening on servers but also with storage, security and networking elements, which is leading to a softwaredefined datacenter (SDDC) environment. “As the data center is becoming more software-driven, infrastructure management systems are getting increasingly integrated with IT management systems. This will make data center infrastructure management (DCIM) software more effective and more useful, including hybrid data center environments. However, this will push companies and suppliers to innovate more and to focus on assimilation,” adds Bhandari. In the coming years, Indian enterprises will focus on building intelligent data centers that focus on optimizing existing hardware assets by adding additional software capabilities. “Several factors such as physical location, types of applications supported, power and cooling, downtime, floor area will help determine an organizations’ tech investment plan. The other aspect of the data center market that will see change is ‘Infrastructure as a Service (IaaS’) space, where both infrastructure and business models are flexible and based on usage. This shift will reduce operating cost and increase utilization of datacenter capacity,” says Vikram. 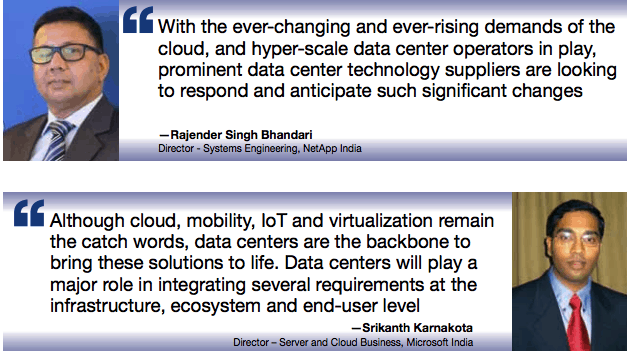 Perennial modernization of data centers will continue to be a key driver for data center infrastructure spent in India. Indian business leaders have identified automation and orchestration as high priorities too. Greater focus on disaster recovery and business continuity, and software defined infrastructures will also lead to an increased spend on infrastructure.